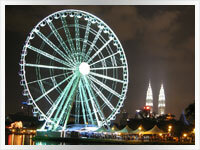 This 22 day Thailand & Malaysia small group adventure/holiday tour package is part soft adventure and part relaxed holiday. With lots of ground to cover and with so many flight choices, we will start in Chiang Mai and finish up on Penang. NOTE: Included is a flight from Penang to either Bangkok or K.L. to connect you with your next destination. You will see and experience some history, go hill tribe trekking, have both warm island and cool mountain relaxation, great shopping and many friendly cultures. This is a great itinerary for food also with both Thai and multicultural Malaysian. It has the lot and is a great introduction for both first-timers or return visitors to Asia as both countries are friendly, safe and hassle-free. And now with two flights replacing the previous overnight train trips, you get even more comfort and destinations. Baktrax’s food advisor from France declares without hesitation that, “Malaysia is undoubtedly the food capital of the world, and Penang is the capital city in this regard. Thai’s will no doubt disagree with this so you can be your own judge as to who has the best. Baktrax takes no responsibility whatsoever for gained weight during this trip. Whether it’s Thai, Malay, Indian or Chinese, this trip has it all. ACCOMMODATION = 3 star hotels x 13 nights; 2 star hotels & guest houses x 7 nights; ; Basic Hill tribe village homestay x 1 night. Two-star guest houses and hotels, (7 nights). Basic hill tribe village homestay, (1 night). Sukhothai historical park, (half day). Hill tribe trek, (Two days, one night). 21 meals included as per itinerary. Tonight our Taste of Thailand & Malaysia small group soft adventure holiday tour will stay in; CHIANG MAI - Our Thailand & Malaysia small group tour package officially starts when we check into our Chiang Mai accommodation. A welcoming dinner will be had in the evening. Chiang Mai is a favourite with all travellers. If you don't temple out in town there is still the mountaintop temple of Phra That Doi Suthep, approx fifteen kilometres away in a national park. For Shoppers, it doesn't get much better than Chiang Mai. After a day at Worowat Market, Airport Plaza and/or dozens of other speciality shops or even Central Festival if you need a homesick mall, you can barter hard at the famous Night Bazaar. Arts and crafts, textiles, silver and clothing are but a few of the great bargains to be had in Chiang Mai. A budget trip to a dentist is another possibility as well to offset some holiday costs. D.
CHIANG MAI - A full day to get out and explore all of the above or maybe some time by the pool for any of those with jetlag. A Thai massage perhaps. B.
Tonight our budget North Thailand small group tour will stay in; PAI - Today by minivan takes our small group tour to our special Thailand town. Situated in a lush valley surrounded by beautiful blue mountain scenery, Pai has an aura all of its own. Pai is possibly the chill out capital of Thailand. The afternoon is free to relax by the pool or take a stroll. A vibrant nightlife of music, restaurants and bars after that is just the beginning. B.
PAI - A full day to relax and/or explore this amazing town in the mountains. Some good as it gets restaurants and markets all within an easy stroll away. B.
Tonight our North Thailand group adventure tour package will stay in; HILLTRIBE VILLAGE HOMESTAY - Pack just a day pack, (our main luggage will be safely stored in Pai), for the two day trek to Lahu, Lisu and Karen hill tribe villages, where you will experience a totally different culture and way of life. We will eat & sleep in very basic huts with our local hosts and experience their very simple way of life. Do not expect a 7/11 out here. They sometimes have no gas or electricity and live a very simple subsistence life, but you will never meet more hospitable people. B. L. D.
Tonight our Thailand small group vacation tour will stay in; PAI - Our cultural adventure trek will finish back in Pai after a fascinating experience. B.
Tonight our North Thailand budget small group tour will stay in; CHIANG MAI - Departing Pai at leisure by minivan will see our best Thailand & Malaysia tour package back in Chiang Mai for another chance to shop eat and/or catch some of the sights you may have missed last time. Another truly fabulous travel destination with the lot. B.
Tonight our small group Thailand travel tour will stay in; SUKHOTHAI - Our small group tour will take a bus today to the first capital of Thailand, Sukhothai. The rest of the day is free to relax or explore before dinner. While the centuries-old, Old Sukhothai is the main reason for our visit New Sukhothai is an interesting town in itself. A great Night Market will get the taste buds going for a start. Grazing with entrees from the nearby street food vendors is a great way to start. B.
SUKHOTHAI - Sukhothai Historical Park; A local operator will take our group tour by Tuk Tuk to explore the old ruins of Sukhothai which is now a UNESCO World Heritage-listed historical park. B.
Tonight our Thailand & Malaysia small group tour package will stay in; BANGKOK - Today by bus for the long trip to the Thai capital of Bangkok. One of the worlds most visited cities and you also will be fascinated by it. B.
Wat Phra Kaew & the Grand Palace, Wat Pho, Wat Arun. For shoppers maybe MBK or Siam shopping mall among thousands of other shops, malls and markets near and far. 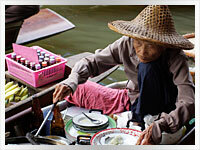 Or take a boat with the locals on the Chao Phraya express to some local markets in Nonthaburi. A few of the dozens of other possibilities may be Vimanmek Teak Mansion, Chinatown, Wat Traimit, Jim Thompsons House, Silom or Sukhumvit road shops. OR? Maybe just lay back and have a traditional Thai Massage. BANGKOK - A free day to explore some of the above or as it's a Sunday the famous Chatuchak weekend market is the first choice for many. Truly one of the worlds great markets. B.
Tonight our Thailand & Malaysia small group food tour will stay in; KUALA LUMPUR - A short international flight today will see our group tour in the Malaysian capital of Kuala Lumpur. No uncomfortable 22-hour train trips for Baktrax travellers. B. This is where the foodie part gets even better as we are in the centre of Chinatown just to begin. OOHHH! The choices? As we stay in the heart of Chinatown, nearby Petaling street has a multitude of street vendors. An amazing amount of choices at meal time will be the toughest thing we have to decide on today as a real food Chinatown surrounds our accommodation. Tonight our Taste of Thailand & Malaysia comfort tour package will stay in; MELAKA - A short morning bus ride today will have our small group tour in the UNESCO World Heritage City of Melaka. B. Between seeing and eating you can browse at the many shops along the famous Jonkers street now called Jalan Hang Jebat or at the modern shopping mall of Dataran Pahlawan. MELAKA - A full day to explore all of the above which is centred around today's Chinatown. Maybe a riverside meander for Banana Leaf meal in nearby Little India? B.
Tonight our Thailand & Malaysia small group tour package will stay in; TANAH RATA - A chance for our small group tour to cool down for a while as we head by local bus to the hill station town of Tanah Rata, the main town in the Cameron Highlands. At up to 1800 metres above sea level, it's blanket weather year round at night with cooler but not cold days most of the year. Some of the attractions include the Tea Estates. Sam Poh Temple and the Sri Tehnadayuthapany Swamy Indian Temple. But with the cooler climate, the major pastime for many visitors is hiking along the mountain trails of which there are numerous marked ones. Once again a foodies delight awaits in Tanah Rata with some of the best South Indian restaurants in Malaysia. Just one worthy of a mention is Restaurant Bunga Suria which is just about as good as it gets for South Indian food. Lots of Arts and Craft shops nearby to tempt you also. B.
TANAH RATA - Check out the environmental awareness in the highlands before either a morning or afternoon half day tour of the region today. The tour includes a visit to the Boh Tea Estate a Chinese temple and a butterfly farm while all the time enjoying the great scenery as you go. No meals. Tonight our Thailand & Malaysia foodie holiday tour will stay on; PENANG - FOOD! FOOD! & FOOD! By local bus again today will see our group tour in Georgetown the big and busy capital of Penang island. Lastly, but not least, another chance of a budget visit to a local dentist to offset some of your holiday costs. No meals. PENANG - FOOD! FOOD! FOOD! First up today we will partake in a feast of traditional Indian breakfast treats. After that is a free day to explore this fantastic destination. But without a doubt one of the main purposes of coming to Penang is the FOOD! Our accommodation is within a few minutes walk of a multitude of Malay, Chinese or Indian restaurants. Penang's famous Curry Laksa or Indian Tandoori chicken with Garlic Nan bread are just but 2 of the better known local favs. This will be another chance to eat the local way with a Banana Leaf Meal and it doesn't get much better than a bottomless one at Krishna Villa restaurant in Little India. B.
PENANG - A final free day to continue our exploration of yet more food, go shopping and/0r sightseeing or maybe get a local bus or taxi and explore the island at large with beaches and small villages adding another dimension to it all. D.
Our Taste of Thailand & Malaysia soft adventure holiday tour is officially over after we check out of our Penang accommodation. No meals. NOTE: A flight to either Bangkok or K.L. is also included to connect you to your next destination. P/P, T/S Land only; Includes flight from Bangkok to K.L. & flight from Penang to either K.L. or Bangkok.